Monochrome laser printers print specifically in black and white and have been popular option for with business users for a long time. If you are in the market for a new machine, Brother® monochrome printers are a great choice due to their dependability and low operating cost. Every Brother monochrome printer includes a black and white toner cartridge that provides crisp reliable prints at a reasonable price. In this article we will be skipping the printer conversation and focus on solely on the cartridges themselves. From installation to output, we will go over all the ways these types of cartridges are related (and some ways they aren’t) so you can know exactly what you are working with! First, we will introduce you to the cartridge basics. Each series mentioned here includes a standard yield and high yield cartridge option (we list the standard yield cartridge number first, followed by their high yield counterpart). The term high yield is used to describe cartridges that contain more ink. 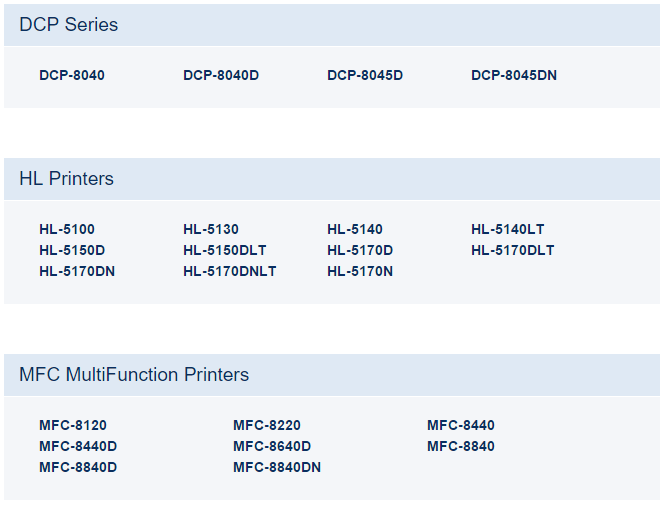 If you are using a high yield cartridge you will get more prints due to the higher ink capacity. The moderately filled standard cartridge is the most common option however, producing a smaller number of prints than the high yield. Consumers that only print on occasion will be happy investing in these less expensive cartridges, but if you print frequently, it’s probably better to go for the high yield. 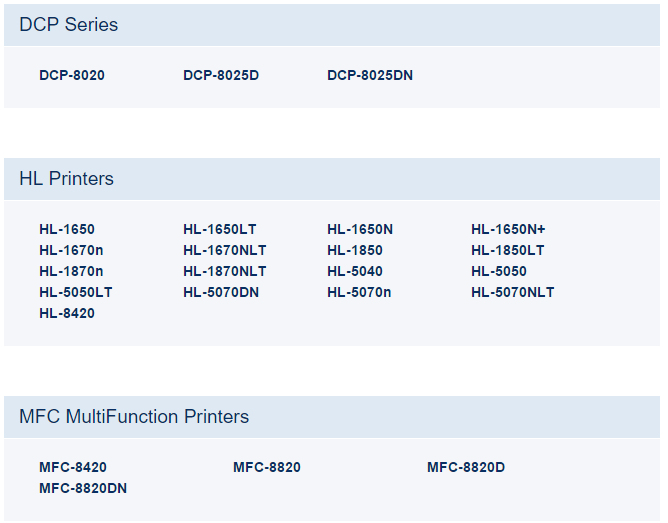 For example, the standard yield TN-420 offers a yield of 1,200 pages, while the high yield TN-450 offers 2,600 pages. Compatible versions of the Brother brand are worth considering if you are looking to save some cash. 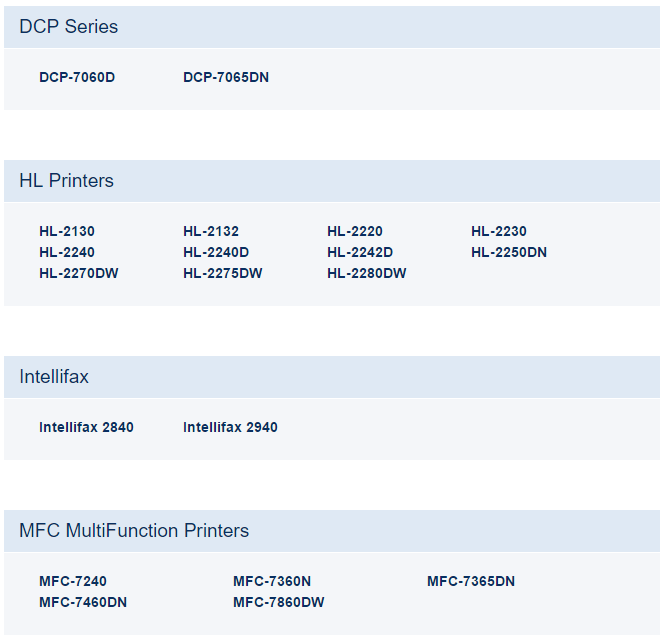 Here's a list of top Brother toner cartridges with a list of printers they are compatible with. Before installing a new cartridge, remove the protective covering that surrounds the toner. This cover protects the cartridge during shipment and the toner will not fit properly if it is still attached. Gently shake the cartridge back and forth a couple of times to redistribute the toner powder. A small amount of toner may emit from the cartridge, so be sure you do this over a trash can to avoid a mess. Every Brother toner cartridge fits into a drum unit. The drum unit sort of looks like a tray and you will need to remove it from your printer in order to install the cartridge. 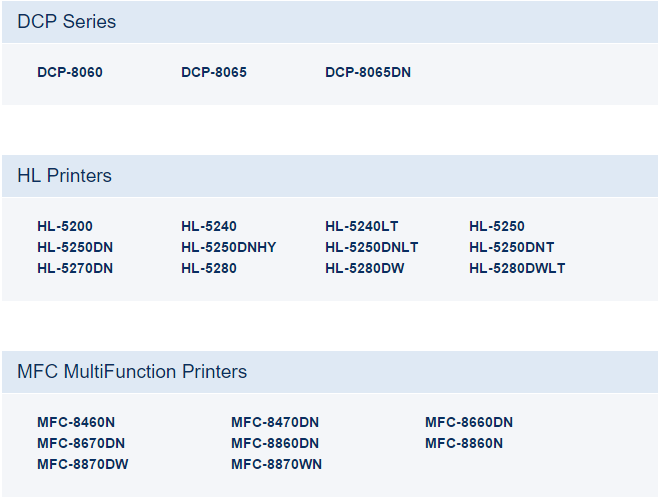 Other major printer brands like HP and Canon sell their cartridges with the drum unit built into the toner but Brother sells them as two separate consumables. The toner cartridge should click into the drum unit easily. Make sure it is locked in securely, otherwise it will not fit into your machine. Clean the corona wire located on top of the drum unit by sliding the small tab from right to left a few times. Put the toner and drum back into the printer (they should now be one combined unit) and close the front cover. Open the front cover of your machine and remove the drum unit and toner cartridge assembly. Pull the blue lock lever to remove the toner from the drum. Click the toner into the new drum, it should firmly lock into place. Do not close the front cover yet. First, you’ll need to inform your printer that you are installing a new drum. This resets the counter on your drum unit so it is able to once again keep track of its expected lifespan. The instructions on this will vary depending on what printer you have, so you will want to consult your specific manual for the appropriate steps. Confirm you are placing the drum by pressing “1” on your printer’s console. Close up the front cover and you should be ready to print! If you recently installed a new cartridge and you are still getting a “Toner Low” message on your machine, you might need to manually reset the toner life. Occasionally when you replace a Brother toner the built in page counter, or what Brother calls the “toner life,” will still need to be reset. 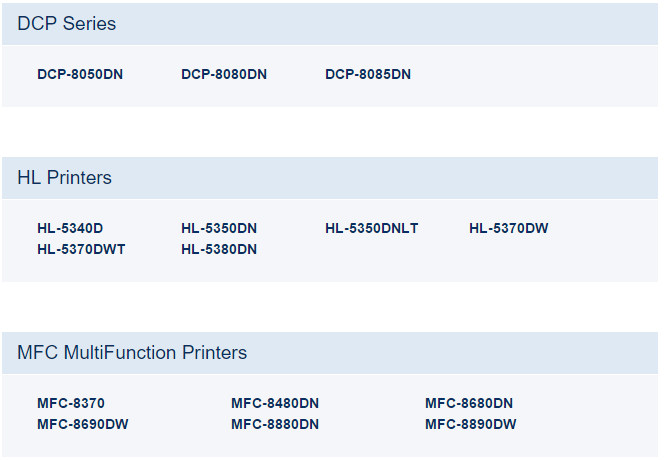 Bes sure to research the appropriate steps for your specific printer, since the steps vary a bit from machine to machine. Open the front cover and leave open while completing the following steps. Hold the ‘go’ button while turning the printer on. All lights should be on. Release the ‘go’ button (or “start’ button). Press the ‘go’ button (or “start’ button) 2 times. The paper light should be on or flashing. Print quality issues can happen from time to time and are generally easily remedied by simply removing the toner from your printer and gently rocking it back and forth to redistribute the toner powder (Make sure you do it over a trash can to avoid a potential mess!). You can also try cleaning the corona wire on the drum by sliding the green tab from right to left a few times. If you complete these troubleshooting steps and still aren’t getting the quality you want, it might be time to replace either the toner or the drum. 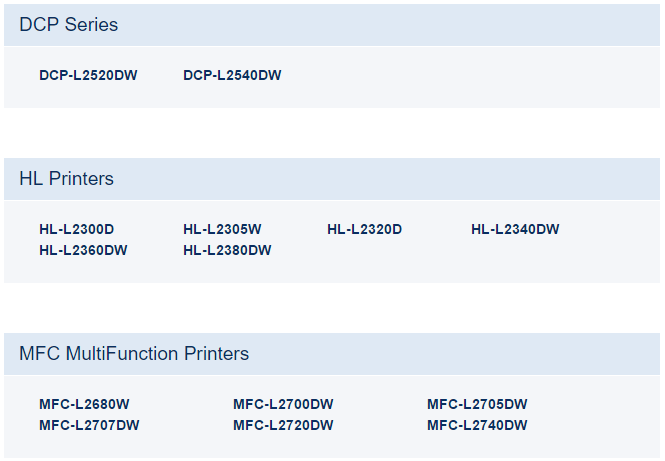 The toner’s page yield should give you an idea of how many prints to expect from each cartridge and the drum should be replaced after every three or four toners. Your printer typically does alert you when it’s time to make the change. Streaky prints may also be caused by your drum, and a simple drum cleaning will likely resolve the problem. To do this, carefully remove it from the printer. Place it on a flat surface with a paper towel underneath to prevent toner from spilling onto your desk or carpet. Gently wipe the drum roller with a dry, lint-free cloth. Make sure you do not touch the drum; it is very sensitive! 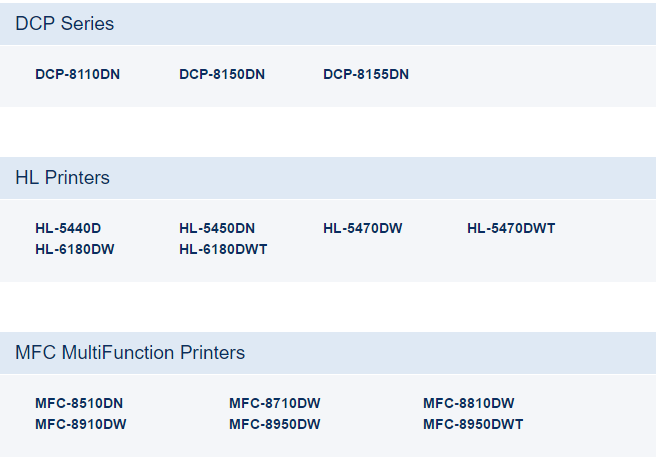 For Brother monochrome printers specifically, the drum unit is a separate item from the toner cartridge and must be re-used. If the cartridge is not fitting or is too small, then you may not be installing the cartridge into the separate drum unit. Double check to make sure you have separated the old drum unit from the old toner cartridge and are re-using the drum unit with the new toner. Brother’s monochrome printers are incredibly reliable and can go a long way if cared for properly. 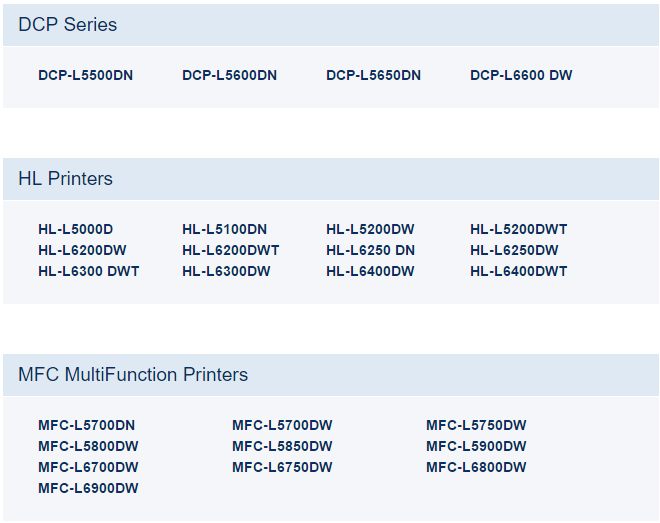 Regular upkeep and maintenance is paramount to ensure your printer continues to operate at peak performance. Many of the troubleshooting advice mentioned is universal across all Brother monochrome machines, so if you own more than one, you are well on your way to becoming a troubleshooting expert.